Flame Cutting and Burnouts | Rode Welding Inc. 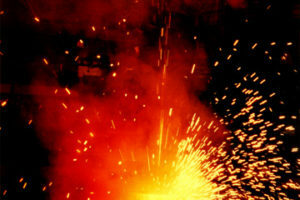 Among our main custom fabrication services, Rode Welding offers customers flame cutting and burnouts. 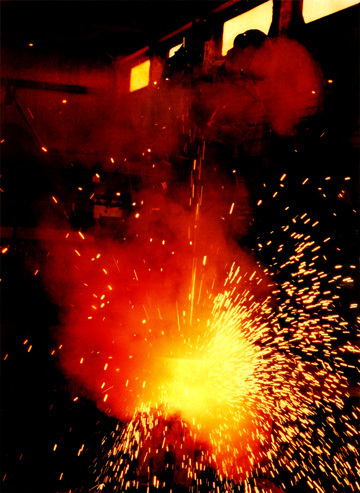 This process is a high purity oxygen cutting technique (also known as oxy-fuel cutting or oxy-fuel gas cutting) used to separate and shape metal with a torch. The process can be performed manually or machine-operated and the resulting workpieces are called burnouts. The flame cutting process, though it is over 100 years old, is still a highly effective method of precision cutting metals such as carbon steel. An outer ring of acetylene, propane, or mains gas preheats the surface of the steel to about 1,600-1,800 degrees Fahrenheit. A stream of oxygen then flows from the central jet to oxidize and pierce through the material. The purity of the oxygen used in flame cutting (at least 99.5% pure) is what enables such precisely cut steel parts and plate burnouts. Even a slight reduction in purity will significantly diminish the torch’s cutting speed so having the right equipment with leak-free hoses and proper connections is critical. At Rode Welding, we pride ourselves on our commitment to technology and outfitting our facilities with the most advanced equipment. 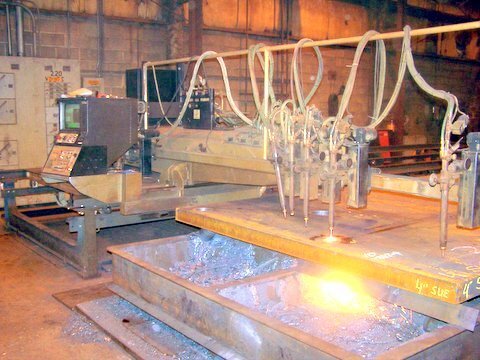 We utilize three modern CNC flame and plasma cutting lines that can cut plates sizes up to 100” x 720” and 120” x 360”. 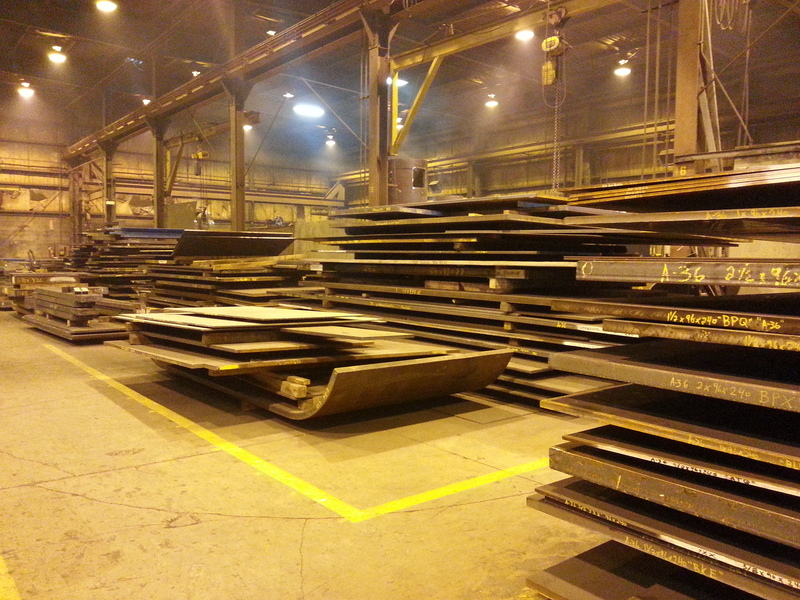 Our machines cut steel plate thicknesses from 0.25” to 24” with unparalleled accuracy, and can achieve single and multiple bevels as required. Some materials such as aluminum cannot be flame cut because their oxide is higher than their melting point. 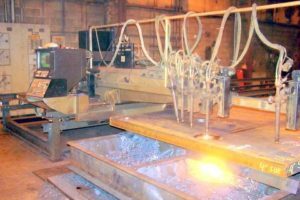 For materials like these that are not conducive to flame cutting, we offer a plasma cutting service that can achieve thicknesses of 1.5” and sizes up to 96” x 480”. Our precision flame and plasma cutting processes can produce burnouts in a variety of shapes, thicknesses, and finishes. Using customer CAD drawings, we can program our machines to cut complex designs with straight line bevels and tight tolerances, and we can finish any part with our secondary services such as machining and grinding. 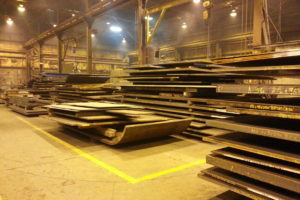 Because of the dangerous nature of this high temperature, high pressure steel fabrication technique, the Occupational Safety and Health Administration (OSHA) presents many federal requirements to ensure worker safety. Rode proudly exceeds all local and federal regulations within our facilities, and our team of highly skilled and experienced technicians produces work that meets every industry standard for quality. Rode Welding has over 65 years of hands-on experience supporting our flame cutting and custom steel fabrication services. From the moment you place your order, our team will guide your project every step of the way to ensure that you always receive the highest quality parts, on-time, at fair prices. For more information about our flame cutting and burnout capabilities, contact Rode Welding today.